Meizu has today revealed two new smartphones for the Indian market, the Meizu 16 and Meizu M6T. The former comes with flagship specifications coupled with sleek design, while the latter is targeted for the budget segment. Meizu has today announced the launch of its latest smartphones in India. Dubbed as Meizu 16th and M6T, both the smartphones are priced at Rs 39,999 and Rs 7,999 respectively. The devices will be exclusively available on Amazon soon. The company has partnered with Reliance Jio to announce some bundle offers. Users opting for Meizu 16h will get Rs 2,200 cashback along with 100GB of additional data. For Meizu M6T, users will get Rs 2,200 cashback and 50GB of additional data. Starting with the Meizu 16th first, the smartphone comes loaded with flagship-level specifications coupled with a sleek design. It features a 6.0-inch Full HD+ Super AMOLED display with a screen resolution of 2160 x 1080 pixels. The phone is powered by the latest octa-core Qualcomm Snapdragon 845 processor along with Adreno 630 GPU. It is backed by a 6GB of RAM and 128GB of internal storage, which can be further expanded up to 128GB via microSD card slot. The smartphone comes loaded with an in-display fingerprint sensor, similar to what we have seen in OnePlus 6T, Vivo NEX and Vivo V11 Pro. On the camera front, it features a dual-camera setup with a combination of 12-megapixel wide-angle lens with Sony IMX380 sensor, f/1.8 aperture, laser auto-focus and a 20-megapixel telephoto lens with Sony IMX350 sensor and f/2.6 aperture. For the front, there is a 20-megapixel shooter with f/2.0 aperture. The phone is backed by a 3010mAh battery with mCharge fast charging support and runs on Android 8.1 Oreo, which is based Flyme OS. The connectivity features include 4G VoLTE, Wi-Fi 802.11 ac (2.4GHz + 5GHz), Bluetooth 5, GPS + GLONASS and USB Type-C. It measures 150.5 × 73.2 × 7.3mm and weighs 152 grams. 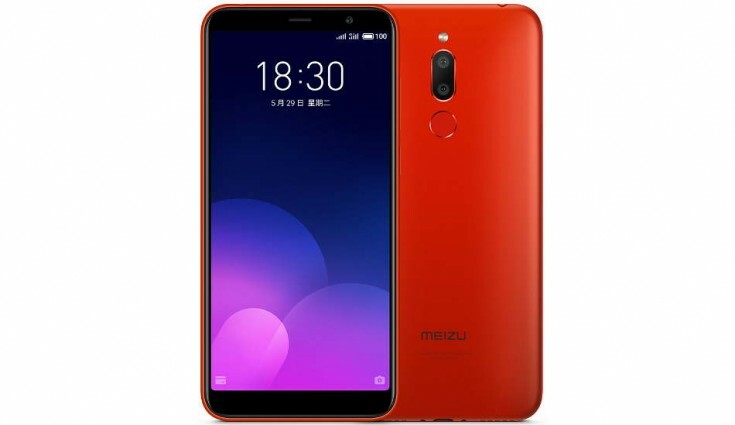 Moving to Meizu M6T, the budget-centric smartphone features a 5.7-inch HD+ display with a screen resolution of 1440 x 720 pixels, 282ppi pixel density, 1000:1 contrast ratio and 450cd/m2 brightness. It is powered by a 1.5GHz octa-core MediaTek MT6750 processor along with Mali-T860 MP2 GPU. The phone is backed a 3GB of RAM and 32GB of internal storage, which can be further expanded up to 128GB via microSD card slot. The phone runs on Android 7.0 Nougat with FlymeOS 6 running on top of it and is backed by a 3300mAh battery. The Meizu M6T sports a dual rear camera of 13-megapixel primary camera with f/2.2 aperture, with LED flash, OV13855 sensor, 5-element lens and 2-megapixel secondary camera with f/2.8 aperture. For the front, it features an 8-megapixel camera for selfies and video chats with f/2.0 aperture. Besides, the smartphone offers 4G VoLTE, Bluetooth 4.1, WiFi 802.11 a/b/g/n, GPS/AGPS and a micro USB port. The device measures 152.3 x 73 x 8.4mm and weighs around 145 grams.